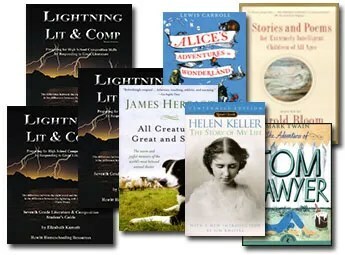 Grade 7 Lightning Lit From Hewitt Homeschooling: Our Review | My Journeys Through Life . . . Herding Cats In New Mexico! ← So, We Are Working On Limits For Video Games . . .
Hewitt Homeschooling was kind enough to send us for purpose of this review their Grade 7 Lightning Lit Student Guide, Student Workbook, Teacher Guide, and a copy of the book Stories And Poems For Intelligent Children of All Ages. In each chapter, The Student Guide gives the student an introduction for the book or story he is reading. It also gives him comprehension questions, vocabulary words, a literary lesson, and a mini lesson. Once he completes his workbook activities for that chapter, then the Student Guide will have him come back and do a writing exercise. The Student Workbook is consumable, so it is for one child only. In it, your student will find writing activities intended to help him hone the concepts, skills and composition he has learned in his Study Guide. Also, these pages will help with thinking skills, and Grammar review. Your student will then find optional puzzles and extra challenge pages. The Teacher Guide is just great! It includes an explanation of the course’s philosophy, a weekly lesson planner (very helpful to me, that! ), the answers to the comprehension questions and the workbook pages, helpful teaching suggestions and extra information regarding the writing exercises. Stories And Poems For Intelligent Children of All Ages is just a fantastic book, and not just for your student, either! This book is a wonderful anthology filled with forty-one stories, tales, and eighty-three poems. These stories, tales and poems come mostly from the nineteenth century or earlier. They are not the “dumbed down” reading material our children often get exposed to these days. they are intended to inspire your child to have a life long love of reading. This is something we want for our boys, as both their father and I are avid readers! This course has 36 weeks worth of lessons, meaning it can be an entire school year worth of Literature and Language Arts. I had chosen this course from the offerings because “The Artist” likes to write, and we already owned the first book required, which was Tom Sawyer. In fact, we already owned two different copies! Here “The Artist” is, working in the Grade 7 Lightning Lit Student Workbook. When he first started this curriculum, he began with the story Rikki-Tikki-Tavi by Rudyard Kipling. This story was in the book Stories And Poems For Extremely Intelligent Children of All Ages, and when he began reading it, he remembered that I read it to him when he was a young child! Then, he moved on to Tom Sawyer. Boom. The complaining began. “Why do I have to read this, I read it last year for fun?” So I explained that this time, he is reading it in a different way, so that he can use it to learn more about writing. He is more willing to do it now. 🙂 I am excited to see how well he does with it over this year! I will tell you that I highly recommend this curriculum, and this company. The books are very well made, and they are attractive to the eye as well.